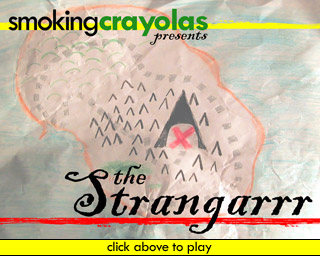 SmokingCrayolas' entry in the Video Association of Dallas' 2nd Annual 24-Hour Video Race. The film we're most proud of. Armed with experience from the first year, we spent the first several hours in the scripting/planning stage. Having things well planned led to a much more relaxed and fun shoot. We had an absolute blast, and we think it shows. During the preliminary screening, the audience seemed to enjoy our film, laughing heartily in all the right spots. The judges even awarded us a trip to the finals, where we didn't fare so well. However, when asked by his father which film was his favorite, a nine-year-old boy within earshot declared, "I liked the pirate one!" Winning the kid vote was good enough for us. Dialogue: "We must be nuts!"